Gavin Crawford. Photo supplied by Workshop West. 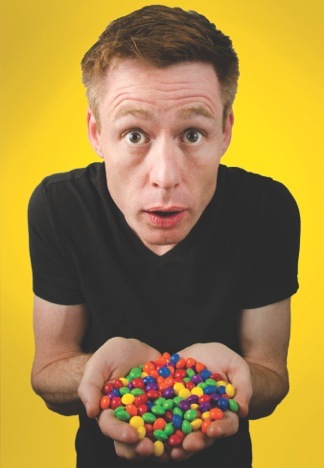 Gavin describes Sh**ting Rainbows as a “very hilarious mishmash” of stand-up, songs, character monologues, and accents. And, if pressed for an overarching theme, he says it is, “Where are we at now in terms of gay people things or otherwise. That’s the general theme, but it’s not all that. There’s politics and it’s kind of a weird satirical look at where we are as a society at whatever moment I happen to be performing.” While not giving away everything you’ll see at the show, Gavin says, “You’ll hear about Facebook, about West Jet, about Quebec, probably Bill 10, there’s some CBC radio things, [and] there’s plenty of Germans [and] Americans.” And he hinted that Severus Snape – or at least his spot-on impression of him – may even make an appearance. Gavin Crawford will be performing Sh**ting Rainbows in Edmonton one night only on January 28 @ 7:00 p.m. to open Canoe Theatre Festival (January 28 – February 1). Sh**ting Rainbows will be followed by an opening gala reception. Tickets are $30 – $35 from Workshop West.